Turning off highway Y31 and onto 98th Street you will start the winding drive into Maquoketa Caves State Park. The first point of interest is a visitor’s center and museum located at the intersection of highway Y31 and 98th Street. Continuing into the park the landscape becomes densely wooded. Park features include, 13 caves with public access, six miles of hiking trails, campground, parking, restroom facilities, a playground, and many Civilian Conservation Corps (C.C.C.) built structures. The campground is nestled in a tall stand of white pine trees. The smell of pine is pleasant as you set up camp. All trailer sites are back-in type and in full shade or partial shade. The camp site pads are level with a crushed stone base. 17 of the 29 campsites have electricity and some of the non electric sites are hike-in type for tent camping. Campers my want to know that site number one is in an isolated spot next to a maintenance building. The campground shower and restroom facilities are well maintained. In the past, people have used the bathroom facilities to wash up after crawling through caves which made it a challenge to keep them clean. In the summer of 2008 a wash off station for cavers was created in the upper picnic area. The station consists of a deck around a water hydrant with a hose and spray nozzle. Maquoketa Caves State Park staff says that it has helped to keep the restrooms clean. At the entrance to the campground there is a clean and functional dump station with potable water. Vehicles with trailers in tow can easily pull through the dump station. The park has 13 caves that are of four types — solutional (formed in the soluble rock), mechanical (formed when the rocks slide against one another), talus (openings formed between piled up boulders) and rock shelters (shallow cave-like opening at the base of a bluff or cliff). The caves are open mid-April through mid-October to allow the bats undisturbed hibernation. All cavers are required to attend a brief, mandatory presentation on white nose syndrome, a fungus that is killing bats throughout the Midwest. You will be asked to disinfect your shoes and not wear gear or clothes that have been in contaminated areas. The caves range from the accessible Dance Hall cave that has a lighted paved walking path to Match Cave that requires you to crawl on your belly toward larger chambers. Many people consider Wye Cave’s large caverns and tight squeezes to be features that make it the signature cave to explore in the park. 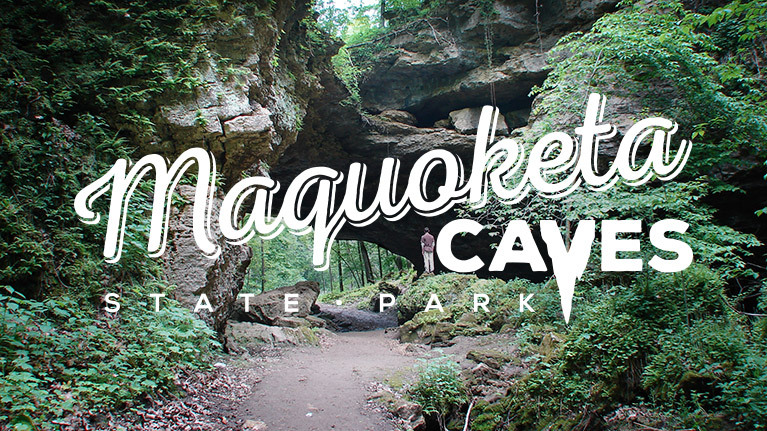 The caves are the star attraction but the trail system can be worth a visit to Maquoketa Caves State Park as well. A manageable 7.62 mile system of trails meanders around the Raccoon Creek valley and some areas of prairie. The rugged areas around the caves have been made more accessible with wooden stairs and boardwalks. 98th Street divides the trail system into north and south trails. Most visitors will start their hikes at the parking area on 98th Street, where you’ll find an information kiosk with maps, a group shelter, restrooms and a large picnic area. This .2 mile trail is the shortest route to access the trail system from the campground. Hike this manageable .10 path along a step rock face to gain access to Twin Arch, Hernando’s Hideaway and Up-n-Down Caves. This .20 mile trail follows the east side of the creek at the bottom of the lush Raccoon Creek Valley. This is a beautiful route in the spring when the flowers start to bloom. Raccoon Creek Trail follows the west side of the creek for .23 miles. You can get to Match and Window caves on this trail. This .52 mile trail is the longest north of 98th Street. Starting at the parking area, it’s a peaceful walk through tall oaks, cottonwoods and elms on your way to Wide Mouth and Dug Out caves. This .51 mile trail is the main access to the caves south of 98th Street. Starting at 98th Street the trail passes Middle Dance Hall Cave and then quickly descends in the form of a rugged stairway past Balanced Rock into the Raccoon Creek valley. Continue along the lush valley floor to the end at Shinbone Cave or explore the network of tributary trails that intersect with Dance Hall South Trail. If you’re looking for the popular Wye Cave then find the .41 mile Forest Ridge Trail. The easiest way to find the trailhead is to locate the parking lot by the picnic shelters and playground. The trailhead is behind the eastern most picnic shelter and you’ll find Wye Cave a short distance in. The rest of Forest Ridge Trail is typically a quiet walk in the woods along the rim of the Raccoon Creek Valley. As you head south the trail descends to intersect with Valley Trail. If you’re looking for scenery other than caves then the .38 mile Outer Loop Trail is for you. Access the trail from Valley Trail or Valley Overlook Trail. There are a couple scenic overlooks and a gazebo that allow you to gaze down at the creek valley below. This .23 mile trail is primarily used to access a C.C.C. built gazebo. There is also an abandon restroom that’s fun to explore. The trail can connect to Dance Hall South Trail by hiking down a rugged washed out ravine. Walk .32 miles along this valley rim trail and catch a glimpse of the Raccoon Creek Valley below. It’s fun to discover the old C.C.C. built gazebo and restrooms on this path too. See the range of diversity at Maquoketa Caves State Park by hiking the .91 mile Valley Trail. Starting at the base of the stairs near Balanced Rock you can trek some of the more rugged areas of Maquoketa Caves State Park. Continue west through the Mechanical type cave tunnel and along Raccoon Creek. At about the halfway point the trail starts a gentle uphill ascent through the timber. The west half of Valley Trail tends to be less crowded and makes for a pleasant hike. At the west end, the trail bursts into a wide open prairie restoration when it intersects with Firebreak Trail. At 2.33 miles, Firebreak Trail is the longest trail in the park. It’s easy to walk on this mowed path through a restored patch of prairie. The trail is for anyone wanting a quiet hike away from the crowds on the cave trails. Native plants and animals can be seen in all directions. This 1.28 mile trail is open to all but its primary use is by those staying in the youth group campground. The trail is a mowed path around the perimeter of a prairie restoration project. Maquoketa Caves State Park is a fun place to go. The old C.C.C. structures give the park a rugged established feel. The accessibility of the caves creates a natural playground for visitors. It’s not the largest park in Iowa but the cave system provides many unique opportunities to explore. It doesn’t cost anything to enter the caves. The park is free. The trails and caves are self-guided. Are we allowed to bring dogs? I would check with the Ranger at the park. What a great way to start your trip. Yes – this is perfect for families. The trail system is not large but packed with caves and places to crawl or hike. There really is something for everyone! Hello, are the campgrounds open currently and how much would it cost? I would like to get permission to use your photo of the valley trail in my article for Spoon University. The article is on hiking spots near the Quad Cities and Maquoketa is part of it. If given permission I would include your name in the article as photo credentials. There are some tent sites in the campground or if you have a larger group you can use the group campsite. How much of the park is wheel chair accessible? The trails are pretty rugged and not wheel chair accessible. There are several picnic areas as well as the campground that could accommodate a wheel chair. The park is free to enter. However, due to road construction Feb 5 through August 24, 2018 the park will be closed.